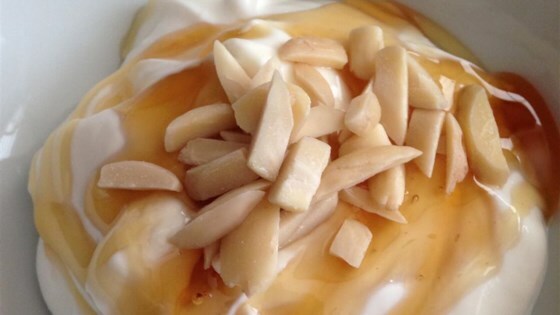 "This recipe is my variation of one that came with my yogurt maker. It's easy to create Greek yogurt from this, too! Simply strain the yogurt in a colander lined with fine cheesecloth or coffee filters. Using kefir at the start creates a much more tart yogurt from the start; it tastes a lot like Sana from Europe. You can substitute plain yogurt with live active cultures for the kefir, if desired. Save 1/2 cup of yogurt to use a starter, if desired. Eat yogurt within a week." Preheat a yogurt maker or slow cooker on Low. Whisk milk and dry milk powder together in a saucepan over medium heat until almost boiling, about 4 minutes. Cool milk to lukewarm (100 to 110 degrees F/38 to 45 degrees C). Cook on Low until desired level of tartness and yogurt consistency is reached, 4 to 10 hours. Chill yogurt in the refrigerator, at least 2 hours. This creamy homemade cheese perks up bagels and sandwiches.